Winter is the perfect time of year for packing up the snow gear and hitting the slopes. 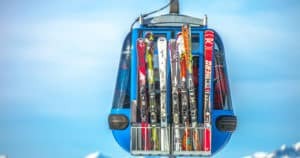 Whether you’re interested in skiing or snowboarding through the trails or exploring the horizon on a lift, you’ll find the terrain you need at your local ski resort. Fortunately, there are plenty worth visiting near Indianapolis. Here are just three we recommend. Head to Paoli Peaks for your next skiing escapade. This resort offers eight lifts and 16 unique trails, ranging from beginner trails like Bunny Meadows and Indiana Jones, to intermediate trails like Mind Bender and Powerline, to the Bobcat and Graber’s Express for advanced skiers. This 45,000-square-foot ski and snowboard resort also boasts two terrain parks and a 10-lane snow tubing facility, plus all the rentals you need to get everyone in on the fun. Paoli Peaks is open daily from mid-December through mid-March, and its current event calendar promises plenty of fun activities for children, college students, and adults of all ages. So pick a date, invite your friends and family, and enjoy a thrilling snow adventure near Indianapolis. Address: 2798 W. County Road, Rt. 25 S. Paoli, Indiana. There’s so much to explore when you book a trip to Perfect North Slopes. This resort features an incredible 22 trails, five chair lifts, and six carpet lifts ideal for skiers and snowboarders alike. You’ll also spot two terrain parks and a 1,200-foot-long snow tubing area, making it easy to find an activity that everyone can enjoy all in one facility. The best part — it’s open seven days a week and offers late night hours during certain holidays. If it’s your first time on the slopes or you’re simply looking to improve your skills, the resort’s Snow Sports School Staff conducts daily lessons for both children and adults. There’s also a four-week program offered exclusively for children to help them learn the ins and outs of skiing and snowboarding. These are great ways to get everyone out of the house for some fresh air and winter fun. Address: 19074 Perfect Lane, Lawrenceburg, Indiana. If you head about three and a half hours north of Indianapolis, you’ll eventually hit Swiss Valley in Southwest Michigan. This ski and snowboard facility features 11 runs, seven lifts, two terrain parks, and the highest vertical peak in the area at 225 feet. The Ski & Board Shop is also at your disposal and offers all the equipment and apparel you need to hit the slopes with confidence. If you’re traveling with pets, no worries! Backcountry Kennels is a great lodging destination for your furry friends and is situated a quarter of a mile north of Swiss Valley. Plus, this resort is typically open from mid-December to mid-March, though you can find specific hours of operation and price rates on their official website. Address: 13421 Mann Street, Jones, Michigan. If you’re stumped on where to head this season for the best skiing and snowboarding opportunities, consider hitting up one of these top resorts near Indy!